Prices from: £1550 incl. integration Exc. delivery and VAT. 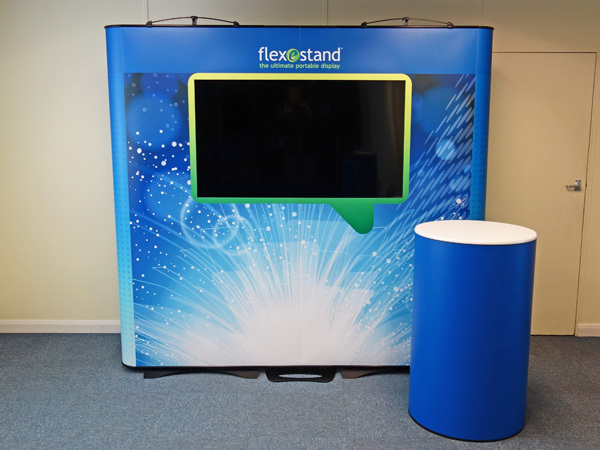 This FlexeStand big screen solution adds a whole new dimension to a display and real wow factor. It takes just a few minutes to fit this lightweight, flush-fitting 55in screen. No expertise, no experience and no tools required. Plug in one power lead and your USB memory stick, and you can be playing your slideshow or video within a few clicks of the remote control. Simple! All brackets are pre-fitted to screen and are ready to use. The screen is supplied in the manufacturers cardboard shipping box unless another carry option is ordered as follows. If a client pre-owns a compatible 55in screen then it may be possible to integrate it into a FlexeStand kit. If suitable then a maximum of £450 can be deducted from the solution price. The screen has to be sent to us for modification. A screen case option is not available for a client supplied screen.